What’s the last thing you see before going to sleep and the first thing you touch when you wake up? It’s a question DeGroote Associate Professor Nick Bontis often asks – especially when he relays his findings on knowledge worker productivity to various organizations. The answer, unsurprisingly, is your smartphone. In his research, Bontis has discovered that productivity has a significant variance. Just as many people, he says, are openly collaborative and productive as those who get bogged down with information overload — partaking in a pattern of procrastination and mindless activity. Think social media. While we have a seemingly endless amount of intellectual capital at our fingertips, the way we disperse that information to our colleagues makes up another of Bontis’ current areas of study – knowledge management. In this area, Bontis says he was surprised to discover how prevalent knowledge hiding behaviour is. There are various ways to reduce knowledge hiding and increase productivity, says Bontis. At the individual level, we must look at how employees interact and make it seamless. At the group level, it is essential to examine how collaboration can be accelerated. Finally, at the organizational level, we must invest in workplace tools that codify an organization’s intellectual capital. Beyond these areas of research, Bontis is currently fascinated with crypto-currency such as Bitcoin and how the underlying blockchain revolution will transform academia and business. His research has garnered more than 25,000 citations from 100 refereed journal publications, and his academic findings have been discussed by media outlets during more than 800 interviews. Nick Bontis is recognized internationally as a leading strategy and management guru. 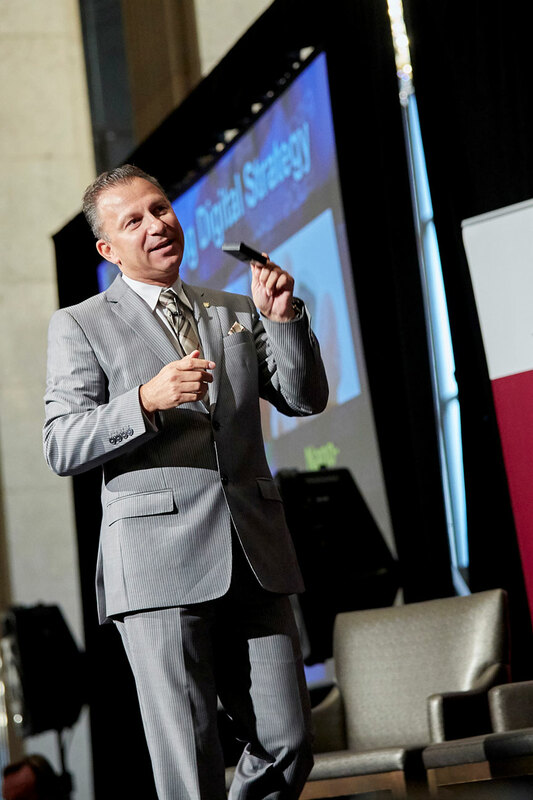 With humour and passion, he empowers individuals, teams and organizations to build their brainpower for high performance and sustainable competitive advantage. Tom Stewart, former editor of Harvard Business Review and Fortune Magazine, states that “he is not only a pioneer in the field of intellectual capital, but one of the world’s real experts as well.” His dynamic delivery and concrete advice leaves audiences enlightened, inspired and ready for action.